Kytola Model L flow meters are ideal for water or gas purging applications, as well as general flow measuring of liquid or gas. 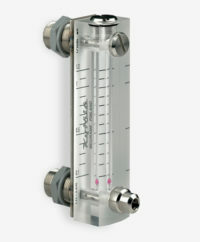 The Model L design features a robust plastic flow tube (see below for available materials) with an easy to read scale, and a flow adjustment valve. A constant flow regulator is a construction option, if required.